As the chandelier came crashing down from the ceiling, there were squeals of mixed delight and terror. I think that mixture of delight and terror sums up this classic musical very well as the phantom plots to get the object of his affection, Christine Daaé, into the spotlight. There were moments when I was delighted with the elaborate staging and operatic vocals, but there were an equal number of moments when I was confused about a character’s motivation or true intentions. While at first it seems that the phantom is in love with Christine and she will return his feelings, he becomes abusive and threatens to harm members of the opera, manipulating them with threatening letters. Her other love interest, Raoul de Chagny, a childhood friend, at first seems more like a brotherly figure than a lover. 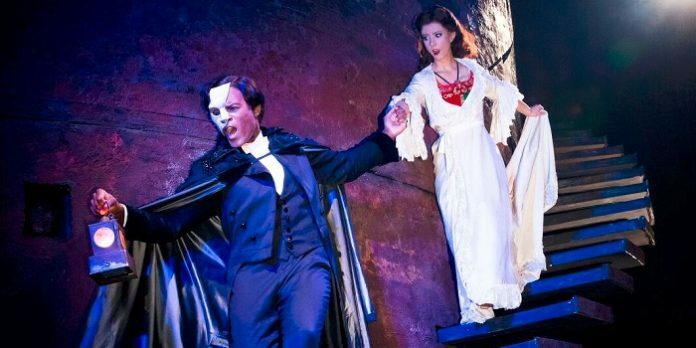 This twisted love triangle is hard to untangle as Christine seems to sympathize with the Phantom, but also loves Raoul which in turn angers the Phantom. She seems to harbour feelings for him despite his monstrous treatment of her and everyone in the opera house. This is one of those musicals that have almost all of the dialogue in song, which can be a bit tiring especially when it’s in high pitched opera tones. When the phantom sings “I am your angel of music,” it’s easy to think that Christine and the phantom will share a tender romance, but it is soon evident that the phantom is a monster who has targeted Christine. One of the most impressive elements of this production was the elaborate set design by Paul Brown, including a semi-circular structure that moved back and forth to seamlessly transition to a wide range of settings including inside the opera house, the Phantom’s lair, and a courtyard. It also has retractable stairs that extend to lead down to the Phantom’s lair. The Phantom’s flaming boat that takes Christine to his lair full of hanging candles reaffirms the gothic influences of the story. In “The Music of the Night” we see the tender side of the Phantom, but this is short lived. From his box in the opera house, the Phantom watches Christine with pride as she rises to become the next primadonna. The sets of the opera’s productions are ornate and extremely detailed, including a sumptuous Versailles inspired scene with pastel colours and huge curly-haired wigs. The New Year’s masquerade was another beautifully staged scene, with dark outfits trimmed in jewel tones. Raoul and Christine share an over-the-top love song where they sing “Love me, that’s all I ask of you,” and the Phantom who has been ominously listening in repeats their sentiment while it’s clear his jealousy will get the better of him. Derrick Davis was wonderfully dark and brooding as the Phantom, while Christine was played by the talented Katie Travis who balanced the conflicting emotions of her character very well. With a multitude of special fire effects including the falling chandelier, flaming piano, flaming boat, and some fire bombs thrown during a fight with the Phantom, this was one of the most technically demanding musicals I’ve seen. That combined with the impressive set pieces and costumes makes it a wondrous sight, even if the storyline and gothic romance isn’t for everyone. The Phantom is a frustrating character who instills an uneasy terror in everyone at the opera house and makes it hard to gauge his intentions, but I was delighted with the visual spectacle of this classic work in the musical theatre canon.